Perhaps a little hyperbolic but at least we got your attention. But no one could question that the weather was perfect for the race participants in this year’s Westfield 5k Pizza run! The WCM New Jersey office had a great turnout with Paul Clark, Denise Ricci, Heather Aquino, Joe Broccoli, Ken Eng, Jorgelina Foglietta, and Mike Noblett flying the firm’s colors, and Carole Becca, Marie Lindner,Tiffany Braithwaite, Ann Marie Murzin, and Vivian Turetsky cheering the team on from the sidelines. Special kudos to Heather for completing the race while holding baby Ava! Denise finished 4th in her age group with Jorgelina close behind. Before the race began, there were rampant rumors that Paul Clark would not be participating in this years race due age-related infirmities. We were surprised to see Paul geared up and ready to go as the race was set to begin. Kudos to Joe Broccoli who put his peer pressure tactics to good use and persuaded Paul to run the race! Mike Noblett and Ken Eng ran for the first time this year – with Mike completing the race as the quickest male at WCM (but with the worst athletic wear) and Ken not far behind (fun fact: Ken used to run cross country – but Paul still pulled ahead of him in the final sprint). Steve Kim finished the race with grace but rumor has it that he was got passed by several children running without their shoes tied. After the race, the group gathered at Darby Road Public House & Restaurant for some food and libations. Perhaps there are some audience members who would like to join the team next year! Thanks to Steve Kim for contributing this post. Some consider insurance coverage law as exciting as watching paint dry on a basement wall. Others approach the subject matter with enthusiasm, akin to delving into a spirited philosophical argument about the nature of truth, beauty, or excellence. The understanding of the term “occurrence” in an insurance policy sometimes feels more like philosophy than law. The subject may involve the exploration of temporal and spatial relationships, the unfortunate event test, and intervening agents and factors. In Selective Ins Co of America v Rensselaer (COA), the New York’s Court of Appeals recently examined the definition and application of the term “occurrence” used in a police professional liability policy issued to the County of Rensselaer by Selective Insurance Company. The Policy defined “occurrence” as “an event, including continuous or repeated exposure to substantially the same general harmful conditions, which results in …’personal injury’… by any person or organization arising out of the insured’s law enforcement duties.” The policy went on to cite four specific examples that were “agreed to constitute one ‘occurrence’.” Of significance, the Policy also contained a deductible of $10,000 per occurrence, inclusive of legal fees and expenses. In Selective, the County was faced with a class action involving about 800 class members arising out of the County’s policy of strip searching all people entering its jail regardless of the nature of the crimes alleged to have been committed. The problem was the 2nd Circuit previously declared such policies unconstitutional. Faced with such bad law, the County and its insurer Selective elected to settle the action for $1,000 per class member and $5,000 for the class representative. After the settlement funds were paid by Selective, it demanded payment of the Policy’s deductible from the County and argued that the search of each class member was a separate occurrence. Thus, according to Selective, the County was responsible for the entire indemnity payment of about $800,000 plus associated legal fees. In response, the County countered that the entire action constituted a single occurrence and refused to pay more than a single $10,000 deductible. The Court held that the claim of each separate class member constituted a single occurrence. It emphasized that unambiguous provisions in an insurance policy should be given their plain and ordinary meaning and noted that “a court is not free to alter the contract to reflect its personal notions of fairness and equity.” A good omen for Selective. The Court of Appeals enforced what it considered the “plain language” of the Selective policy: the improper strip searches of arrestees over a four-year period constituted separate occurrences under the policy language. The definition of an “occurrence” in the Policy covered personal injuries to an individual as a result of harmful conditions. It did not permit the grouping of individuals unless that group was part of an organization. Each strip search performed over a multi-year period harmed a specific arrestee as an individual and constituted a single occurrence. The Selective case confirms New York’s reputation as a “pro-insurer” state. The Selective Court’s language should temper a lower court’s urge to re-write a plainly written policy provision. The Selective decision also highlights the necessity of hammering out before a settlement is reached whether a civil suit involves one or multiple “occurrences,” particularly when a significant policy deductible applies. If you have any questions, please contact Paul at pclark@wcmlaw.com. One of the more vexing problems in civil litigation is whether a court should overturn a jury verdict on the issue of damages. What may seem to be a well-deserved albeit generous award to one person may seem like a runaway jury to another. Jury instructions on the proper measure of damages for pain and suffering or emotional distress seem vague and subjective. The jury is exhorted to award “what a reasonable person would consider to be adequate and just under all circumstances to compensate the plaintiff” without much guidance on how complete this mission. After an unexpected large verdict, a defendant will either ask the trial judge to vacate the damages award in its entirety or seek a remittitur (reduction) to a more reasonable sum. But how should a trial court in New Jersey perform this task? Should the trial judge draw on his own experience as a former practicing attorney or judge to assess the award? Are comparable verdicts an accurate measure of what’s fair and reasonable in the case at hand? In Cuevas v. Wentworth, the New Jersey Supreme Court revisited the proper standard of review when examining the reasonableness of a jury verdict in a race-based discrimination case. In Cuevas, two brothers of Hispanic descent were hired by a real estate management company as regional vice presidents. After initial success at the company, the brothers were fired after they complained about demeaning and racially insensitive comments either made in their presence or directed at them. The case was eventually tried before a jury and a punishing verdict was awarded against the defendants. The Cuevas court provided a detailed overview of how a trial court should assess whether a jury verdict is excessive. The touchstone is whether the verdict shocks the conscience of the court. In reviewing the award, a jury verdict should be given “the presumption of correctness.” Thus, all evidence should be taken in the light most favorable to the plaintiffs and the verdict reduced only if shown to be grossly excessive by clear and convincing proof. Cuevas also made two specific changes on this subject. First, the court concluded that “a trial judge’s reliance on her personal experience as a practicing attorney or jurist in deciding a remittitur motion is a not sound or workable approach.” Concerned about inherent subjectivity of each judge’s experiences, the court advocated the more objective “shocks the judicial conscience” standard that relies on the particular circumstances of the case before the court rather than the trial judge’s own past experience. Similarly, the court rejected the comparison of supposedly similar verdicts to judge whether the award is grossly excessive. Although viewed favorably in prior cases, the Supreme Court found this method to be a “futile exercise that should be abandoned.” Finding a true “comparable” case illusive, the parties are directed to focus on the particular facts of the case before the court, not on some snippet from the New Jersey Law Journal or jury verdict reporter about another case handled by another judge. The pursuit of perfect justice is a difficult endeavor. While Cuevas purports to eliminate subjectivity in the task of examining a civil damages award, the New Jersey Supreme Court has eliminated a trial judge’s ability to rely on her own prior experience or refer to prior similar verdicts when deciding motions to reduce a jury verdict. Defendants beware because we predict that the trial court bench will become even more reluctant to reduce a jury verdict based on excessiveness in light of Cuevas. Constructive defect litigation has bedeviled the insurance industry for years, particularly in New Jersey, California, and Florida. These claims are complex and generate years of expensive litigation. While many insurers have abandoned the construction/contractor’s market or excluded these risks with “Tract Homes” or Condominium exclusions, others find themselves mired in disputes over the scope of coverage available to contractors involved in construction defect litigation. In New Jersey, one unresolved question was whether the standard 1986 ISO form CGL policy covered a developer/general contractor against claims of consequential damage caused by the faulty workmanship of a sub-contractor. Do such claims satisfy the requirement that “property damage” must be caused by an “occurrence”? If so, are those claims barred by Exclusion l. as “property damage” to “your work”? There are two main takeaways from Cypress Point. First, a standard CGL policy provides coverage to a general contractor for claims of consequential damage caused by a subcontractor. The insurer for a general contractor can no longer disclaim coverage on the basis that the entire project is the GC’s work and therefore excluded from coverage. Second, the Supreme Court invited insurers to exclude this specific risk – participants in the Excess & Surplus Lines market take note – by eliminating the subcontractor exception from the “Your Work” exclusion or adding a breach of contract exclusion. If you have an questions or comments, please email Paul at pclark@wcmlaw.com. 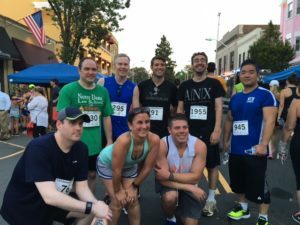 Eight members of WCM participated in the Fifteenth Annual Westfield Pizza Run on the evening of July 27, 2016. The temperature was a balmy 91 degrees but the team persevered. With Captain Denise Ricci on the injured reserve list, the rest of the team regrouped and completed the run in her absence. The Team refueled at Darby Road, a local Irish pub, and discussed implementing several new training methods to improve our performance next year. 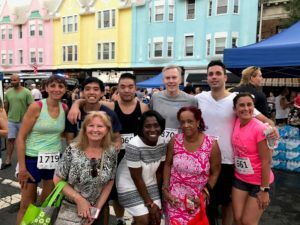 Congratulations to Dan Beatty (overall WCM champ), Jorgelina Foglietta (Women’s champ), Emily Kidder (Bravest for running with a stroller), Joe Broccoli (Best newcomer), Steve Kim (Most improved), Mike Gauvin (Worst shirt with some variation of “Fightin’ Irish”), Paul Vitale (Hottest outfit, wearing all black on a 90 degree day), and Paul Clark (Oldest member of the team). Our faithful fans included Heather Aquino and Marie Linder from the New Jersey office. Every trial begins with an admonition that members of the jury should have no contact with the parties, the attorneys, or the witnesses. The instruction is given to ensure that the jury verdict is based on evidence admitted by the court and not by other outside, potentially prejudicial influences. What happens when a juror ignores the court’s instruction and has a brief interaction with an expert witness? Should a mistrial be automatically granted and the trial started anew? According to a recent New Jersey Appellate Division in Lukenda v. Grunberg, the trial court should determine whether the interaction improperly influenced the juror involved in event and whether the jury as a whole has been tainted. If not, the trial goes on. Lukenda begins with two young adults who got together for some Christmas cheer in the young woman’s family home. According to the defendant, her male guest had too much to drink and was injured when the defendant attempted to wrestle the car keys away from her suitor. In contrast, the plaintiff denied that he was intoxicated and claimed he was injured when the defendant delivered a “blindsided kick” to his knee, causing devastating injuries. Clearly, the Christmas get together was hardly a holy or peaceful night for the young love birds. Plaintiff’s expert orthopedist testified at trial, explaining in detail the lateral force necessary to inflict plaintiff’s injuries. During a break in the expert’s testimony, juror number two approached the doctor and quipped that “he thought the doctor was a great teacher and smiled.” Once defense counsel learned of the interaction, he moved for an immediate mistrial. The court questioned both juror number two and the expert witness about the contact between them. After juror number two assured the court that it would not affect his ability to be fair and impartial, the court admonished the juror to avoid any further discussions about the case until the start of deliberations and denied the motion. The Appellate Division ruled that “a new trial is not necessary in every instance where it appears that an individual juror has been exposed to outside influence.” Under those circumstances, the court’s inquiry should focus on the specific nature of the interaction, whether the juror imparted the outside information to other jurors, and whether the jury, as a whole, has been tainted by the information. Of note, the defendant never requested that the court question the other jurors to determine whether they observed or overheard any part of the interaction between the chatty juror and plaintiff’s expert witness. In Lukenda, the jury ultimately gave plaintiff a gift befitting the holiday season: it found the defendant liable and gave plaintiff a substantial award. The rescission of any liability policy is never easily obtained. The courts scrutinize whether the insurer has met its substantial burden of establishing that the insured made a misrepresentation of material fact. On a practical level, judges are reluctant to grant rescission where it will leave an innocent plaintiff without any source of funds to pay his claim. How should a New Jersey court decide a professional liability insurer’s request for rescission where the insured professional admittedly made a false statement concerning the location of his practice and has no personal assets to satisfy a claim for malpractice? Does it matter that New Jersey requires physicians and podiatrists to maintain significant limits of professional liability insurance? In DeMarco v. Stoddard the New Jersey Supreme Court held that rescission was properly granted to a Rhode Island based insurer where the insured podiatrist falsely represented in the application for insurance that at least 51% of his practice was generated in Rhode Island. The facts of DeMarco are simple. Dr. DeMarco represented in his original and at least three renewal applications that his practice met the 51% requirement. In reality, it appears that the entirety of his practice was based in New Jersey. A malpractice claim was filed against him in New Jersey, which was promptly forwarded to his professional liability insurer to handle. The insurer responded by issuing a reservation of rights letter and filing an action for declaratory judgment in Rhode Island. The underlying plaintiff eventually amended his malpractice complaint to add the insurer and sought a declaration that the insurer was required to defend and indemnify the defendant doctor up to his policy limits of $1 million. In Demarco, the misrepresentation was clear and conceded. The case is significant because the Supreme Court confirmed the right of a professional liability insurer to rescind a policy based on the professional’s misrepresentation of material fact even if the professional was virtually judgment proof. The court also weighed the harm to an innocent claimant against the public policy of discouraging fraudulent conduct against an insurer, and found in favor of the insurer. A rare case indeed. Senior partner Paul Clark recently obtained a defense verdict in the Supreme Court, Kings County before Judge Debra Silber. 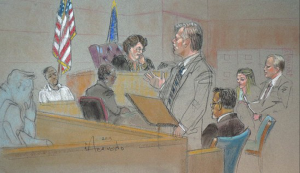 Of note, the case caught the interest of the courthouse sketch artist who captured our cross examination of the adverse engineering expert. In Tompkins v. Larstand Corporation, plaintiff tripped and fell over a misleveled sidewalk that was located on the boundary line between two commercial properties. She sustained significant injuries and underwent a shoulder rotator cuff repair, anterior cervical discectomy with fusion and lumbar laminectomy with fusion. As result, she claimed to be permanently disabled from working. Heeding the advice of Paul and the co-defendant’s counsel, the two adjacent property owners reached an agreement that they were jointly responsible for the sidewalk. This agreement eliminated a significant dispute with the other defendant and freed the defense to focus solely on challenging plaintiff’s theory of liability rather than pointing fingers at each other. Plaintiff claimed that the sidewalk was unsafe but Paul successfully argued that the sidewalk, when viewed in its entirety, was no different than most City sidewalks and that the 1 ¼ inch lip was not dangerous. Despite a difficult jurisdiction for the defendants, the jury returned a defense verdict thirty minutes after deliberations began. In an abundance of caution, the insurers settled the case, foreclosing any the probability of a subsequent appeal. If you have any questions, please email Paul at pclark@wcmlaw.com. Issues surrounding expert testimony at trial can be tricky. In some circumstances, the defense attorney can rely on the records of a treating doctor alone, without incurring the cost and expense of calling the physician to the witness stand. Other times, the failure to call the treating doctor can be fatal, leading to the preclusion of evidence on key medical issues. What happens when a non-testifying radiologist reads an x-ray, MRI or CT scan and authors a favorable report? Can your retained IME doctor review that report and indicate that his opinion is consistent with the non-testifying radiologist’s? Can you cross examine an adverse expert if his opinion of the x-ray, MRI or CT scan is inconsistent with the radiologist’s report contained in the chart of the hospital or another treating doctor? In James v. Ruiz, the New Jersey Appellate Division announced a bright line that attorneys in a civil case cannot cross. Under Ruiz, attorneys in a civil case must refrain from: (1) asking their own expert witnesses whether their opinions are consistent with a non-testifying physician’s report; (2) asking adverse experts on cross examination whether their opinions are inconsistent with a non-testifying physician’s report; and (3) arguing during closing statements that the non-testifying expert’s report (and opinion) is either consistent with his expert’s opinion or inconsistent with the adverse expert’s opinion. The James court found the dangers of injecting the opinion of the non-testifying expert’s opinion into the case too great, particularly when the jury never has the chance to observe that expert in court and evaluate her testimony after both direct and cross examination. Akin to a “tie breaker,” the presence of the unseen expert looms too large when one side is constantly referring to the report and the opinions expressed therein but the expert never appears in court to defend its contents. The rule is now clear in most routine cases in New Jersey. If you want to introduce the opinion of a treating physician about complex and disputed matters, you must call the expert at time of trial. If you have any questions about this post, please email Paul at pclark@wcmlaw.com. Participants in recreational sports cannot escape the risk of injury. Fouls, penalties, and cards are common elements of any game. What one person considers competitive play is another person’s cheap shot. How do you distinguish between the two in the context of youth sports? Can rough play ever form the basis of a civil lawsuit for damages? The New Jersey Appellate Division provides the analytical framework to analyze such a claim in C.J.R. v. G.A. C.J.R. involved a recreational lacrosse league for eleven and twelve year old boys. The score was close and time was winding down in the game. The recollection of most witnesses confirmed that G.A. ran across the field and put a hard check on C.J.R., possibly from the behind, causing C.J.R. serious injury. The parents of C.J.R. filed suit and alleged that G.A. acted negligently, if not recklessly, in causing their son’s injury. Applying this test to G.A.’s conduct, the court concluded that while the plaintiff’s injury was unfortunate, the defendant’s conduct was not actionable. Score one for common sense.